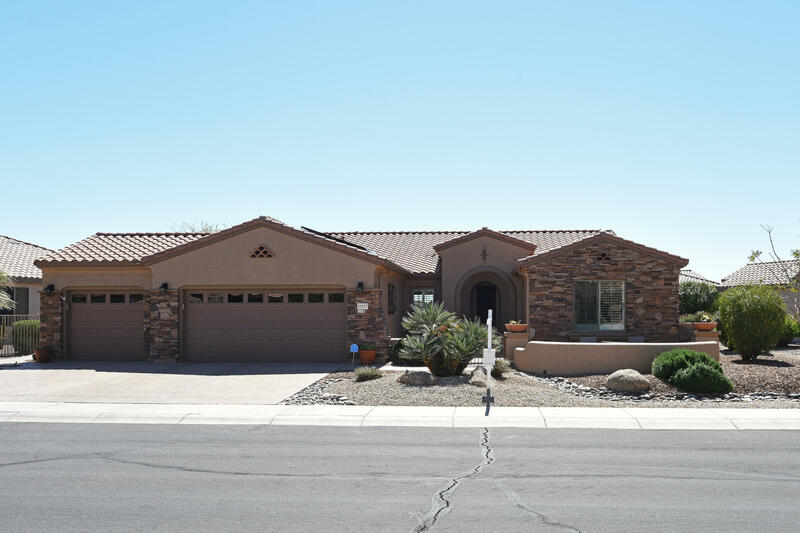 All SUN CITY GRAND homes currently listed for sale in Surprise as of 04/23/2019 are shown below. You can change the search criteria at any time by pressing the 'Change Search' button below. 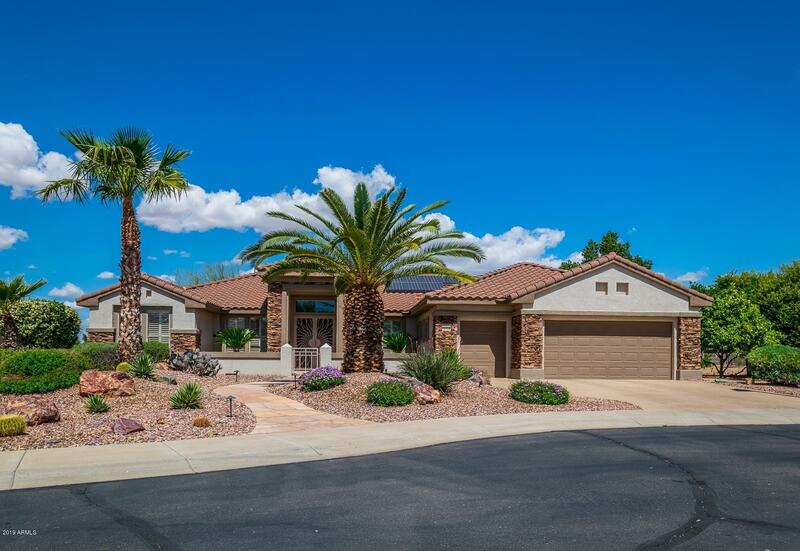 "Stunning remodel on golf course cul-de-sac lot. (hole 4 of Desert Springs). 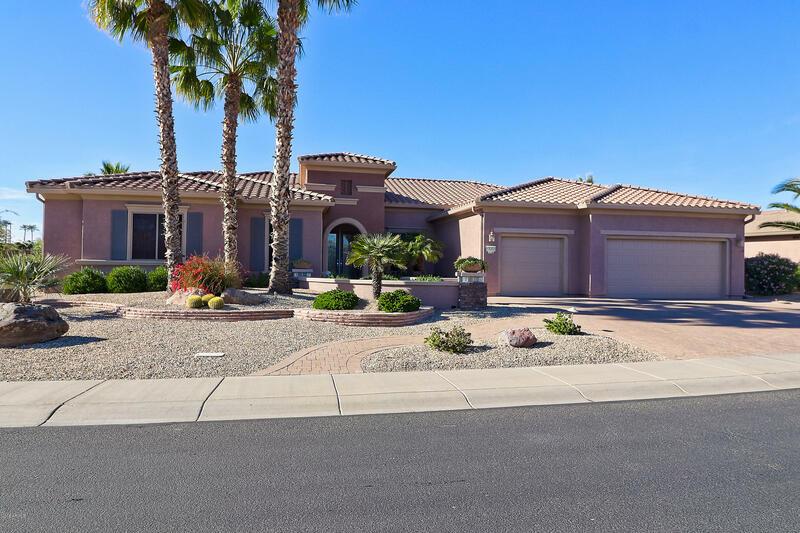 Some of the new features; Italian chiseled edge porcelain tile laid in a Versailles pattern, high profile baseboards, custom walk-in showers, new granite c-tops thru-out, Led lights thru-out, new water softener, new PVC irrigation system, new interior & exterior paint, custom insulated blinds. 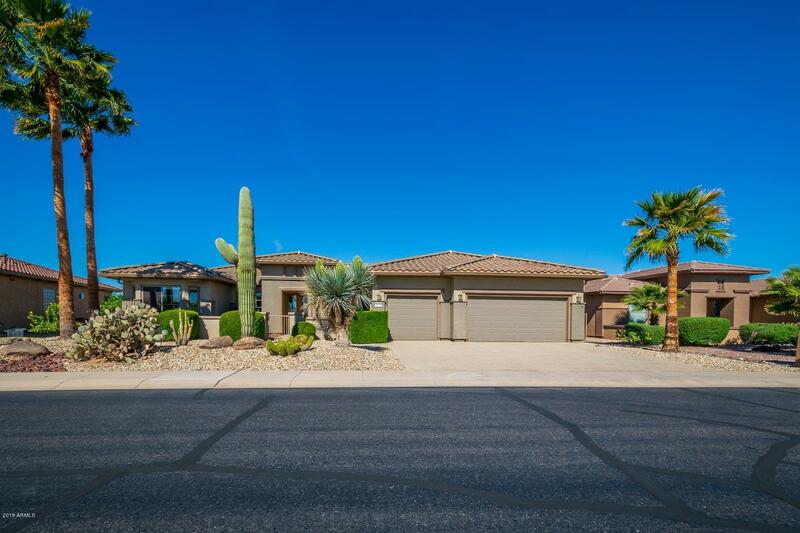 Fabulous new media wall with stacked rock, fireplace, wall mounted 65'' TV, & fully integrated surround sound system & wireless"
"Beautifully designed and updated Sierra w/Casita on a quiet cul-de-sac in Sun City Grand. 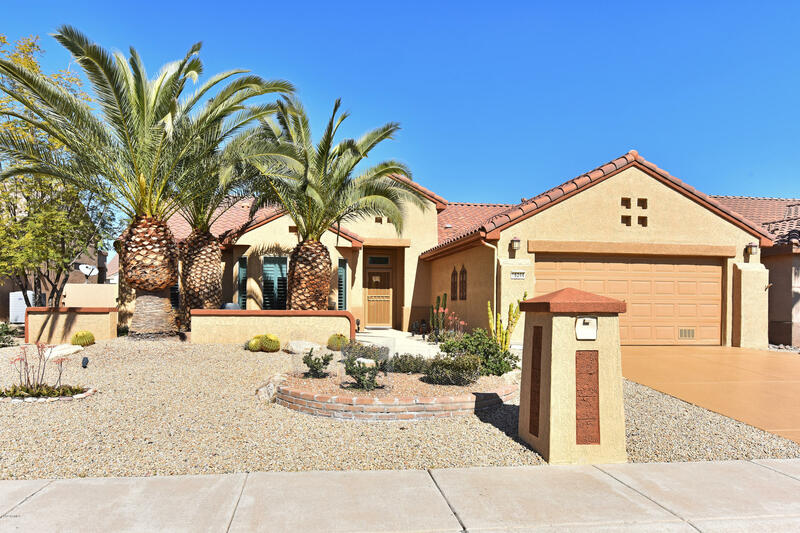 inviting gated front courtyard with gas fireplace greets you! 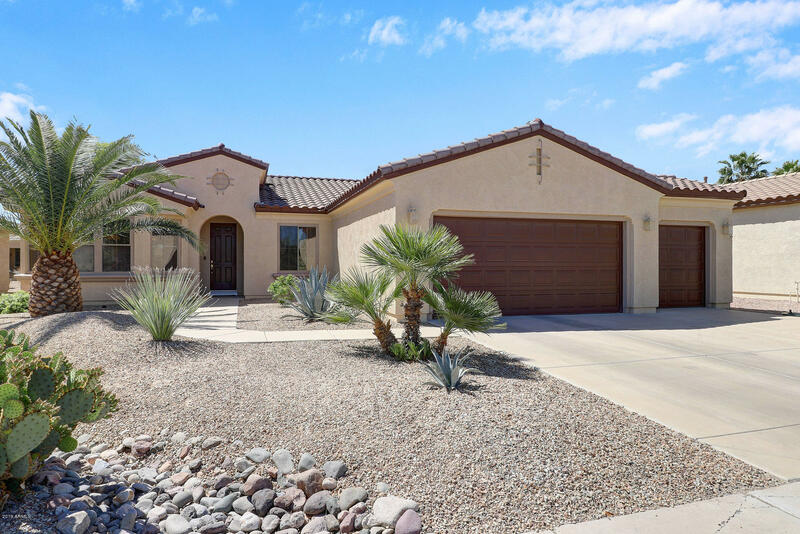 WOW your guests with the custom designed over sized casita which boasts, granite counters, cherry wood cabinets, refrigerator, sink, tankless water system and travertine shower stall. As you step inside this three bedroom home you feel right at home! Great room boasts off-set travertine tile, custom neutral colors, and timeless plantation shutter"
"Fantastic opportunity to own a remolded home in The Grand . Private and quiet location with a premium corner lot. Elegant and functional kitchen was recently upgraded (~$35,000) new custom granite counter tops, new maple cabinets, quality fixtures, and new island. New Maytag (2018) stainless steel appliances, new refrigerator, new microwave, new dishwasher, new oven. Maytag washer and dryer included. New carpet (2018). 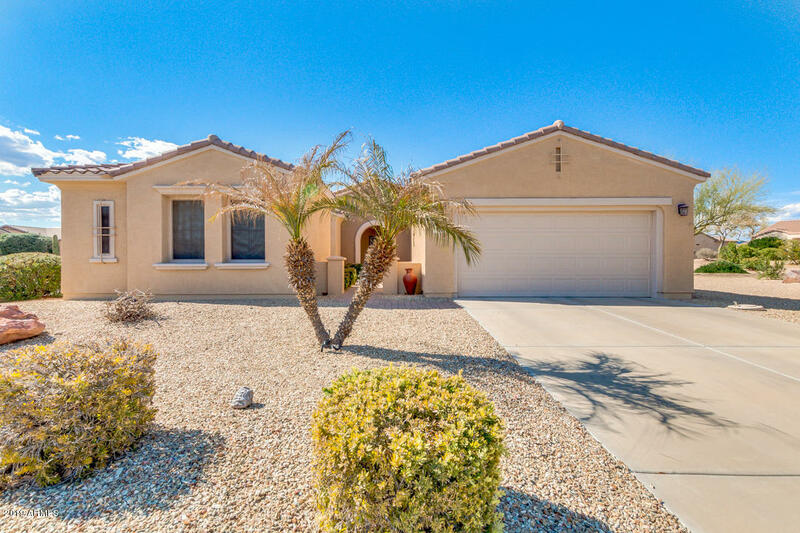 Home exterior recently painted (2018), interior of home painted (2018), cus"
"This 3 bedroom Palo Verde is upgraded to 2019. Great room with custom media wall, electric fireplace & framed windows. Kitchen features new granite counter lowered to one level with breakfast bar. Linen cream soft close cabinets throughout. Breakfast room with bay window. Master suite has a bay window, new redesigned spa shower & double sinks with new granite counters. New ceiling fans & carpet in bedrooms. Guest bathroom has new tiled shower & granite counters. New brushed nickel door hardware." 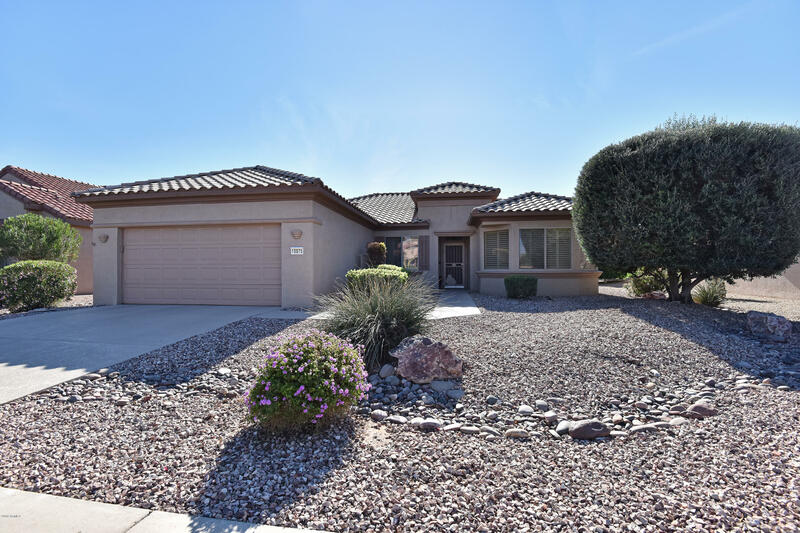 "Sweet Sun City Grand Golf course Verbena with mountain and sunset views. Quartz counters in kitchen, Maple cabs, the desired Kitchen island! Skylight at the kitchen. Outstanding views of Desert Springs #15 from the living room windows. Separate den/office, Bay at master bedroom. All tile home, NEW water heater, Soft Water, Furnace is 6 years new! Comfort height toilets, Reverse Osmosis filter water. 2- car extended garage with side access door. Inside laundry with cabinets and sink. 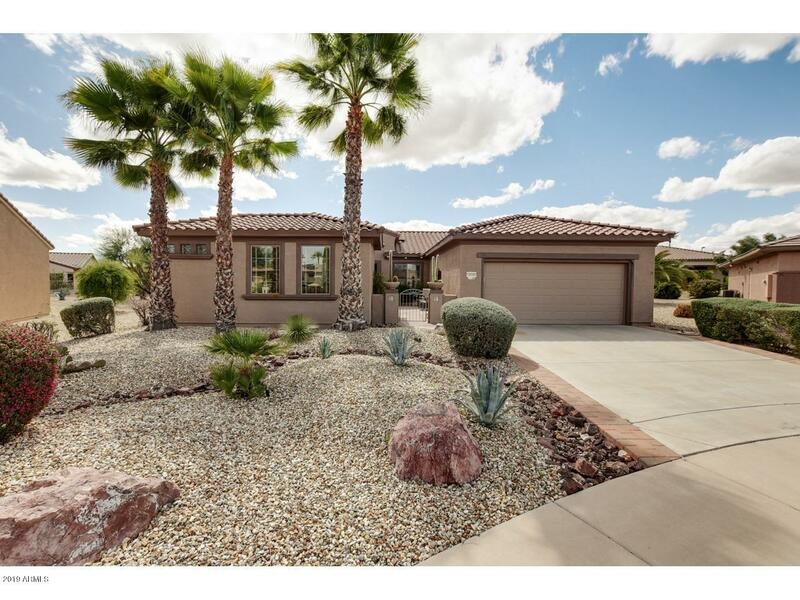 Home Warrant"
"Spacious and desirable MISSION in Sun City Grand, 3BD, 2.0BA, 2282 sq. 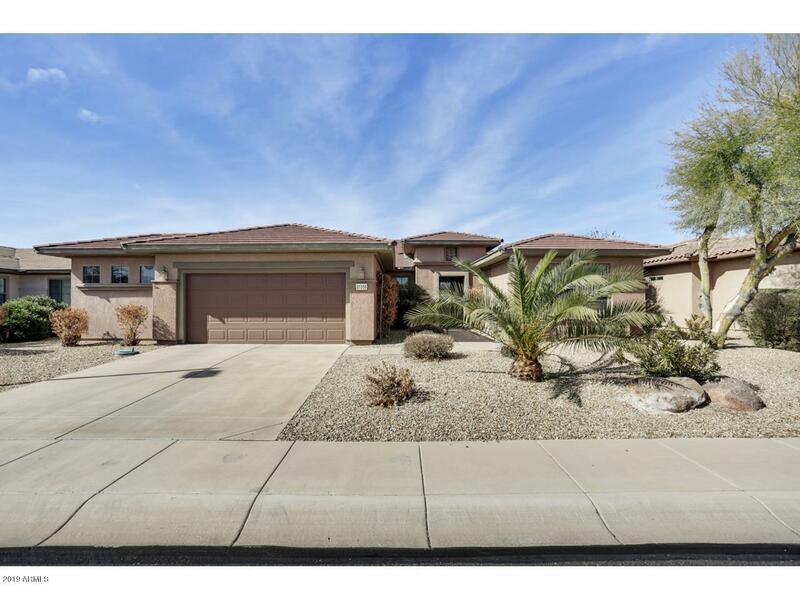 ft. Beautiful curb appeal, north south exposure with walled backyard for privacy. Custom media wall with stacked stone sets the great room apart! Open floor plan super for entertaining. Upgraded cherry cabinets in kitchen with newer stainless refrigerator, dishwasher, pullouts, new gas cook top, new hood over stove and new and oven. New security door. Reverse Osmosis. 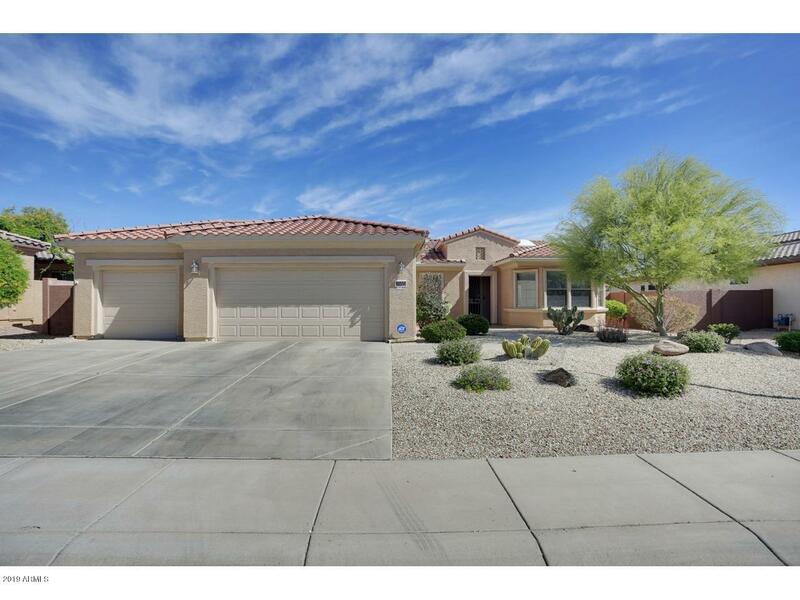 Single door off of Master Bedroom to covered patio.bay wi"
"LOTS of upgrades in this desired SIERRA floor plan on a cul-de-sac lot with an extended 3-car garage in SCG. 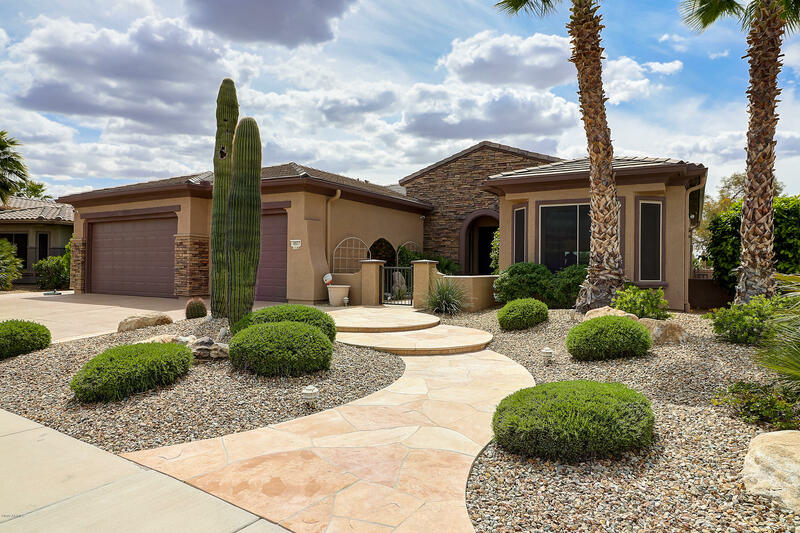 Lovely front courtyard offers mountain views. Silestone counters and backsplash in kitchen. Media wall in great room with gas fireplace. Custom master closet, expansive master bedroom with sitting area. Den/Office with french doors for privacy. Easy to care for NEW over-sized luxury vinyl plank flooring in den, master bedroom and master closet. 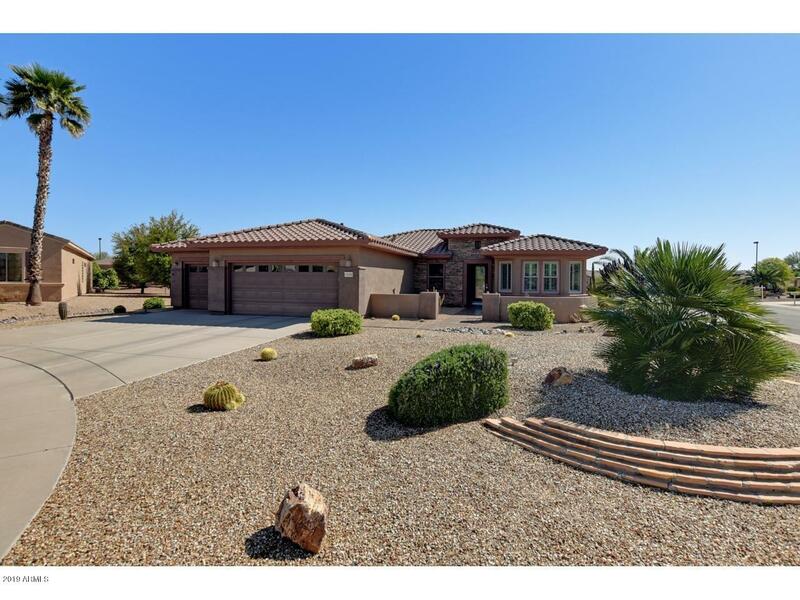 This home has lots of natural light coming i"
"Sweet Sierra, 2075 sq. ft 2BD/1.75BA with 3-CAR garage. 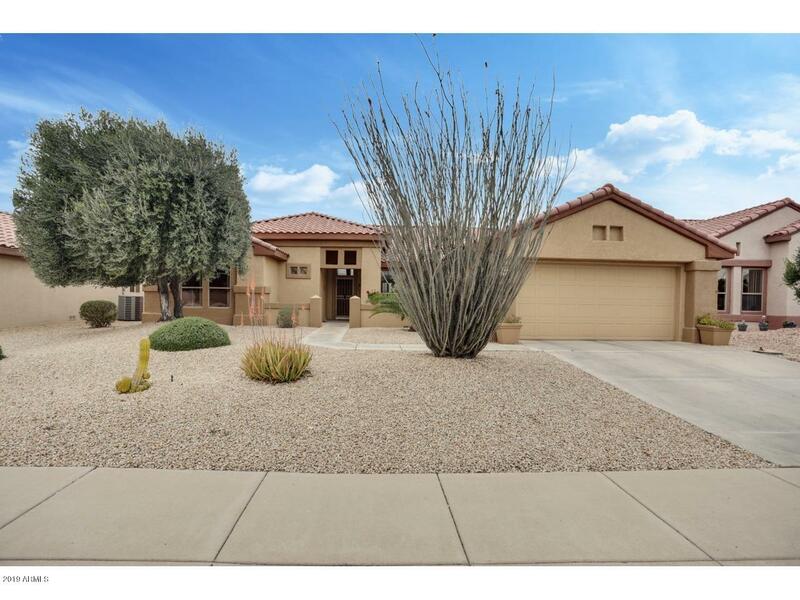 Walled yard for privacy with nice patio perfect for entertaining. Flooring is tile and wood laminate, neutral colors and fire place in great room. Convenient Murphy bed in guest bedroom. Gas cooking in large kitchen with island. NEW furnace 2018, Exterior Paint 2018 and water heater, 2014 Murphy bed in guest bedroom. Rain glass shower in the master shower. Reverse Osmosis, Soft water and skylights. HOME WARRANTY INCLUDED with this home." 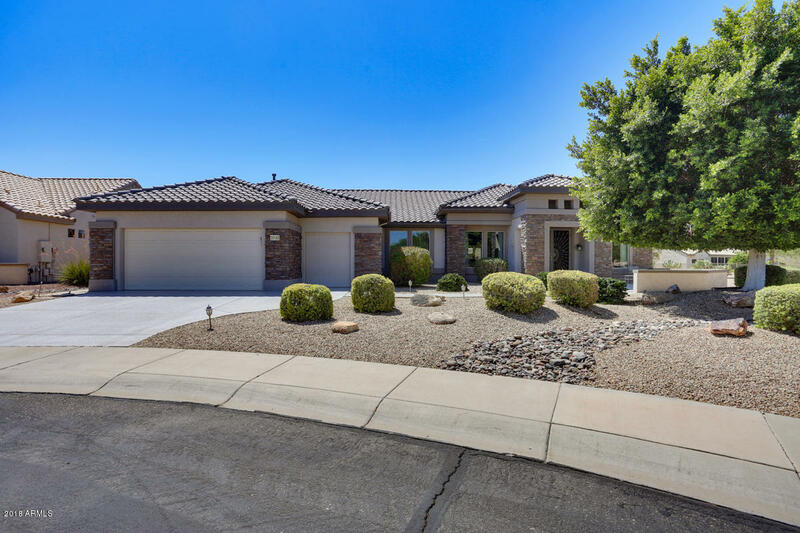 "Sun City Grand Windrose Model With Split Bedrooms; The Master Suite Is Separated From The Other Sleeping Areas Providing Master & Guests With Supreme Privacy. 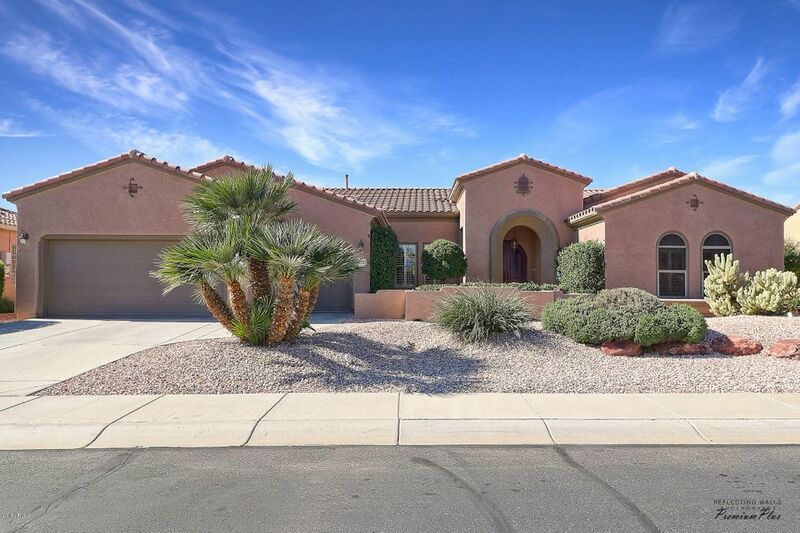 Fine Features Include A Full THREE Car Garage, Walled & Gated Front Courtyard Patio, Raised Six Panel Interior Doors, Media Wall With Ambiance Lighting, Level 5 Slab Granite Kitchen Counters With Tiled Backsplashes & Under Cabinet Lights, Remodeled Guest And Master Baths With Slab Granite Counters, Bay Window In Master Bedroom, Privacy Do"
"This Beautiful Desert Rose Home has been meticulously cared for by the Original Owners. This Floor Plan features a Great Room with Gas Fireplace w/Custom Mantle to match kitchen cabinets, 2 Large Bedrooms, 2 Bathrooms, Flex Room (Office/Den/Sewing/Crafts/Formal Dining/Wine Tasting), and Kitchen with Island and Breakfast Bar. This Lot is Fully Fenced. Shutters throughout except @ Nook in Kitchen. Main house HVAC replaced with Lennox unit in 2013 and Casita HVAC replaced with Trane unit in 2"
"Move In Ready Sierra Model. Great Location With Low Traffic Street . The Perfect Orientation With MorningSun and Shade In the Afternoon On Patio. 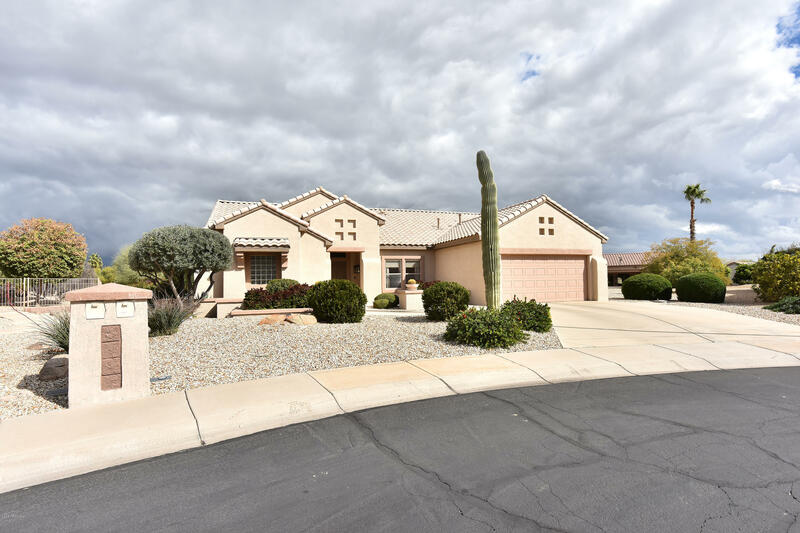 Many Updates and Improvements Include; Large Tiled Flooring in All The Right places, Granite in Kitchen & Laundry Room, Solid Maple Cabinets Throughout, Gas Range, Bay Windows, (5) New Anlin Vinyl Windows, Newer HVAC Complete with a Patriot PCO Whole House Air Purifier. New PVC Irrigation Installed 2018 Just to Name A Few. A Complete list In Home Fo"
"For today's modern color palette of white and dusky grey, this Sierra floor plan has two bedrooms, 2 baths and a den that shows like a model. Home is located on a short street with minimal traffic. Super quiet! Gated private entrance to the front extended courtyard. Custom metal screen door. Large entry way with a great room concept. Tons of light with numerous windows throughout. Neutral tile floors. HUGE master bedroom and walk in closet. 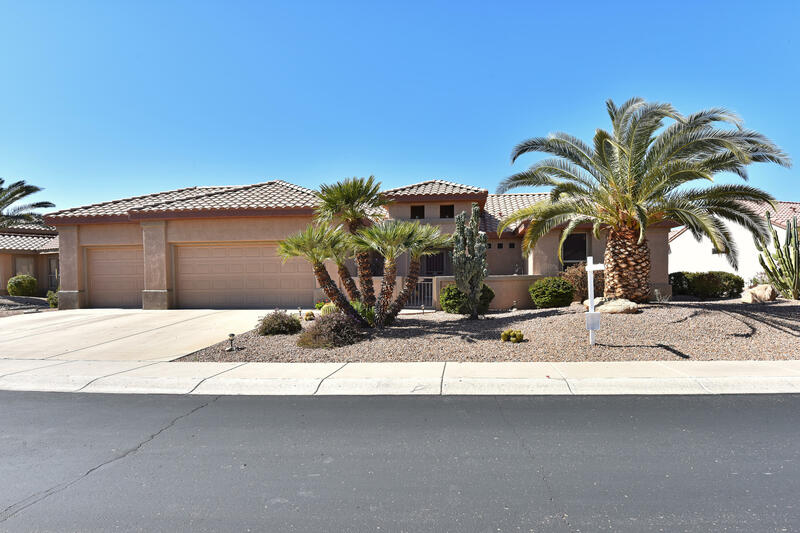 Updated master bath with walk in shower and tile surr"
"This home is situated on a short non-busy street & boasts a full 3 car garage plus a golf cart bump out. The kitchen features a two working islands, lots of cabinets, lots of counter top space, Maple cabinets with raised panel doors, GE appliances & a functional breakfast nook. The bedrooms include a large master bedroom with a full master bath a large soaking tub, dual sinks, large walk-in closet; a guest suite with a tub/shower & a walk-in closet. 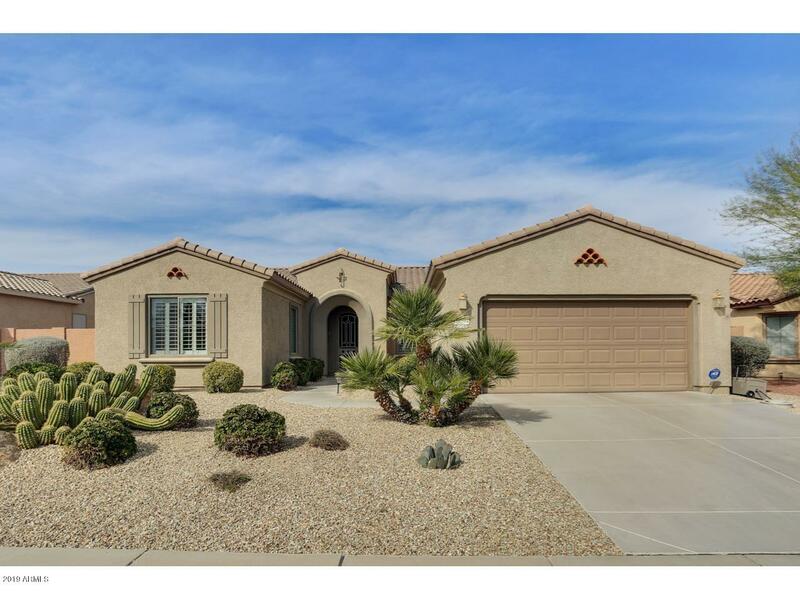 Outdoor amenities include an expanded patio, p"
"Popular Sun City Grand Mission floor plan 2282 sq. 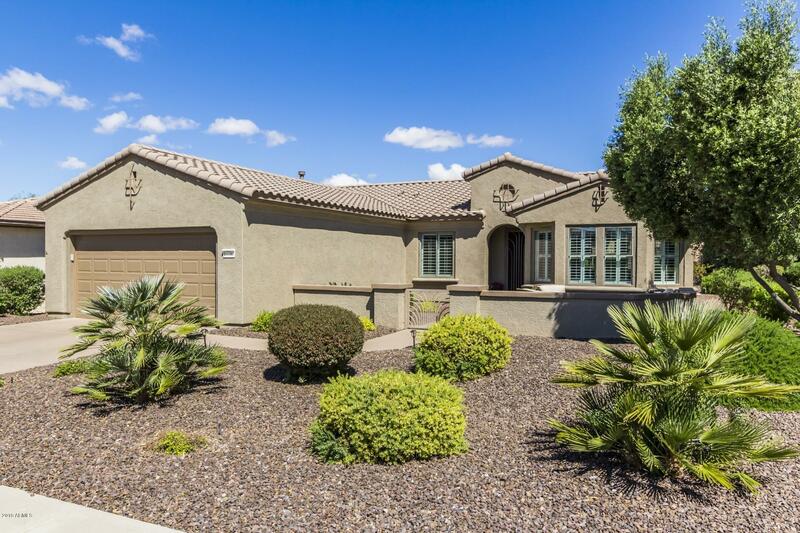 ft, 3BD/2.0BA. Quiet, private street with north/west exposure in the back with mountain views. Large kitchen dining area, kitchen island and lots of cabinets. Guest powder room off the kitchen. Convenient guest suite with full bathroom for your visitors. Bay window in the master with a slider to patio. Full bath in master bath. Large laundry room. Open floor plan, super for entertaining. One new AC and furnace installed in 2018. 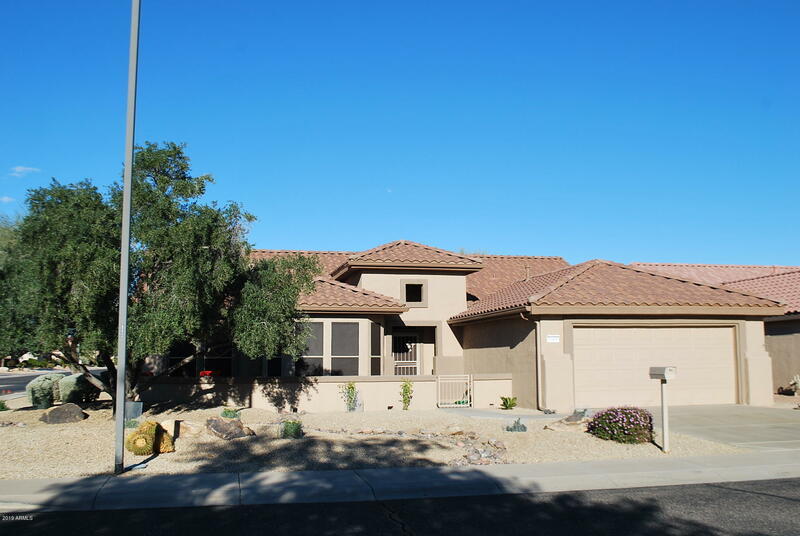 2nd unit is orig"
"Sun City Grand Palo Verde model, Superior & Beautiful! 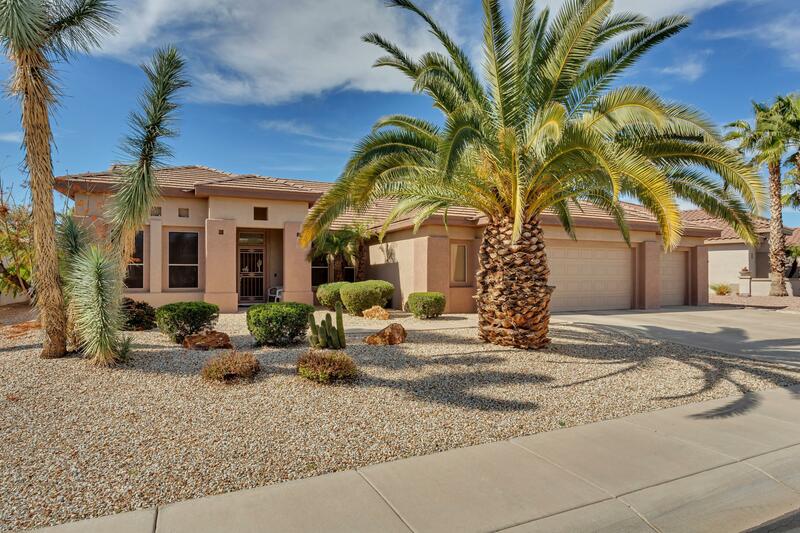 This Del Webb favorite has split bedrooms; the master suite is on the opposite side of the house from other sleeping areas. 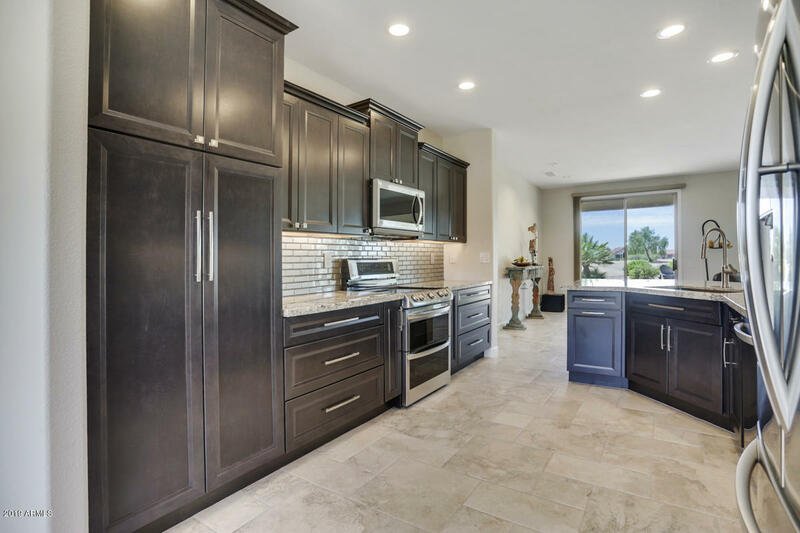 Kitchen is a chef's delight with its 42-inch European cabinets, upgraded appliances and its wide-openness allowing the chef to show guests his/her talents and keep the conversation flowing. 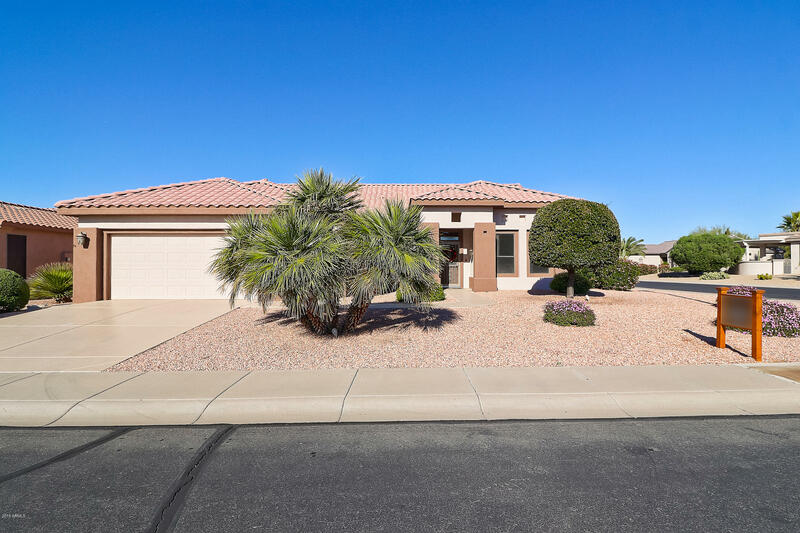 Fine features include oak wood flooring, gas fireplace, dining area extended by 4 feet, Master bedroom extended four feet plus bay "
"You will surely enjoy owning this home and relaxing on your extended covered patio overlooking your low maintenance private backyard! Popular Sun City Grand Coronado model polished to perfection with Diagonal tile, beautiful French doors to patio, Luxury Kitchen with upgraded cabinets, additional kitchen cabinets, gas cook-top, Island, Murphy bed in den, Garden tub and shower in master bath, Bay window in master, Remodeled guest bathroom, Built-in cabinets & workbench in garage, soft water loop,"